Perhaps, though, it ought to also be known as the cradle of cross-cultural fusion cuisine. A trip to Hillcrest’s Khyber Pass Restaurant shows why. Afghanistan’s unique geography—nestled at the juncture of the Middle East, Central Asia, the Indian subcontinent and the Far East—has had many effects on its history and fortunes. As a major stop on the old Silk Road—the trade routes from Europe to China and back—Afghanistan necessarily reached its arms both to Europe in the West and China in the East. Its culture—and, not surprisingly, its food—took some from all but was never permanently assimilated by any. These disparate influences are on display in every plate at Khyber Pass (523 University Ave.). Both of our starter dishes, mantu and aushak (which are available in either appetizer or entrée sizes), were good examples. Each is a dumpling dish that can be understood as a Middle Eastern version of either Italian ravioli, from the West, or Chinese dim sum, from the East. The mantu dumplings are filled with ground beef and served with peas and a garlicky yogurt sauce. The entire affair is laced with paprika and ground mint. Mint and peas? English. The dumpling? Chinese (or maybe Italian). Yogurt? Middle Eastern or Indian. The whole dish? Delicious. The aushak dumplings are filled with finely chopped scallions and ladled with a tomato-and-meat sauce (not entirely unlike a Bolognese), then topped with a yogurt-garlic sauce. Aushak is, according to some, the national dish of Afghanistan. Most commonly, the filling is sautéed leeks rather than the scallions used at Khyber Pass. In truth, the pungent sharpness of the scallions slightly unbalanced the dish. But there was something very appealing—at once exotic and familiar—about the delicate raviolis, the big and comfortable flavors of the meat sauce and the fresh feeling of the yogurt sauce. The whole of these two dishes was greater than the sum of the parts. 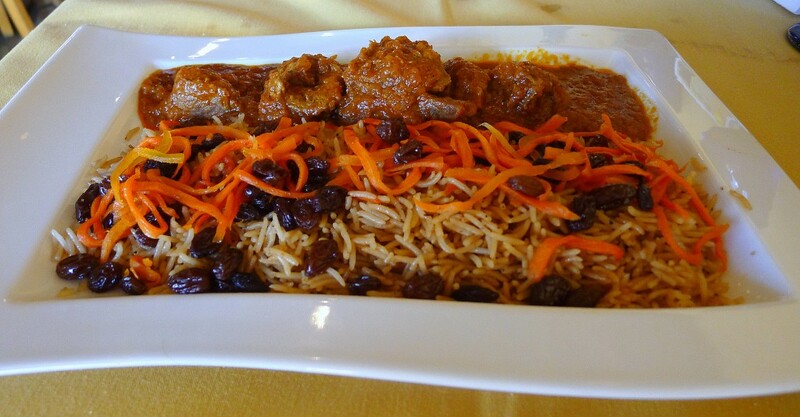 If aushak is not the national dish, that honor must fall to quabili palow, featuring stewed chunks of lamb served with long-grain basmati rice garnished with ribbons of carrots and raisins. It’s a party of savory and sweet arrayed against the earthy, grounding basmati rice. It’s a beautiful dish when served all together in a single pile, and Khyber Pass’ semi-deconstructed presentation is particularly attractive. Many of the greatest states this world has ever known have heard the Afghan call but also felt the pain that its hills, valleys and plains seem so exceptionally capable of dishing out. Each of those states was in such a rush to leave, it seems, that it left its foodstuffs behind. Thankfully, the Afghan people melded all of them into a fusion cuisine that’s bold, nuanced and exotically evocative. Excellent examples of the results can, and should, be sampled at Khyber Pass.